Hugo Boss are a market leader in premium and luxury goods. Synonymous with fashion, the brand covers a comprehensive range of products including apparel, watches, fragrances and writing instruments. Hugo Boss 'Advance' pens combine finely textured fabric with chrome metal accents to create a refined, modern aesthetic. 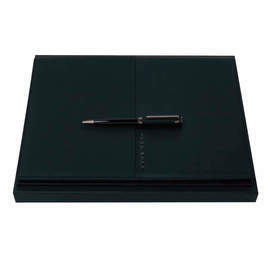 Premium quality Hugo Boss Advance folders and folios with a variety of dividers for documents, business cards and notepads. 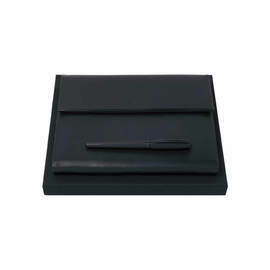 80 page quality 'Advance' notepads with finely textured fabric covers. 'Advance' pairings presented as gift sets. 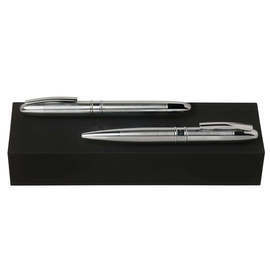 Finely textured fabric combines with chrome metal accents across a range of pens, notepads, folders and keyrings. Squared barrels and circular caps see black lacquer combine with dark chrome accents in these striking and minimal designs inspired by modern architecture. 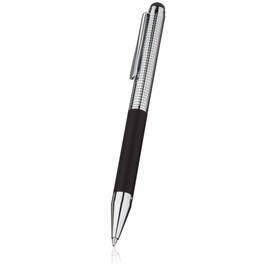 The Bold range features intricately engraved diamond patterns divided at regular intervals by smooth stripes running the full length of the barrel. Polished chrome accents complement matt black barrels. 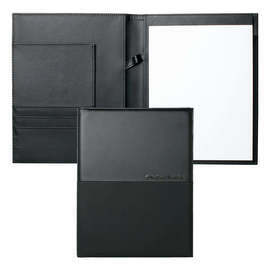 Premium quality Hugo Boss Caption folders and folios in P.U. or leather finishes. 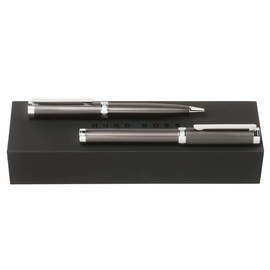 Two distinctive Hugo Boss items combine in these perfectly paired Caption gift sets. The Column range combines sleek profiles with highly technical surface textures to offer a resolutely modern aesthetic. 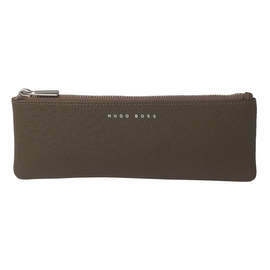 Comprising at least one item from the Column range, Hugo Boss skilfully pair items into sets. 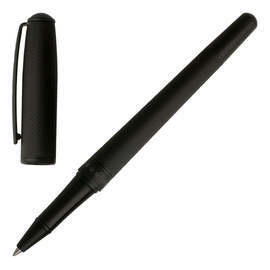 Ideal to give as gifts. The Hugo Boss Essential range combines classically colourful matte lacquer surfaces and light gold accents with sleek, tapered profiles. 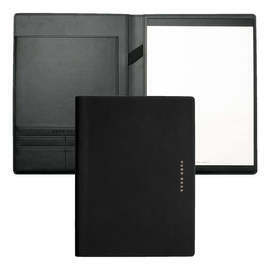 Premium quality Hugo Boss Essential folders in P.U. 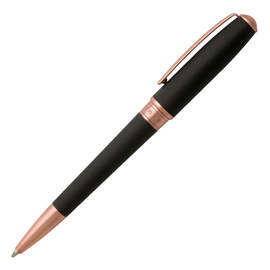 or leather finishes, including their Rose Gold variation. 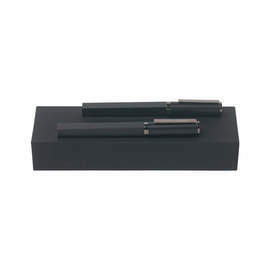 The sleek profiles and finely engraved barrels of the Essential range combine with single-colour matte finishes in timeless black or chrome designs. The Hugo Boss Essential Rose Gold range brings a luxurious splash of rose gold to the sleek, tapered profiles of the Essential range. Essential pairings presented as gift sets. 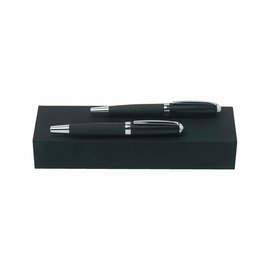 Pen combinations or Essential pens combined with premium quality conference folders. 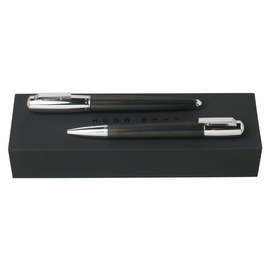 The Hugo Boss 'Essential Striped' range features long stripes engraved along the barrel. 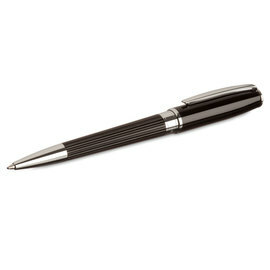 Glossy black bodies and chrome accents combine to present a modern and refined aesthetic. 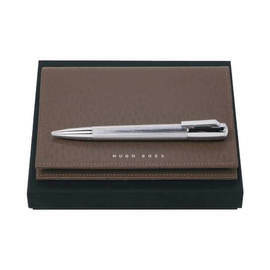 The Hugo Boss 'Icon' range exudes timeless elegance. 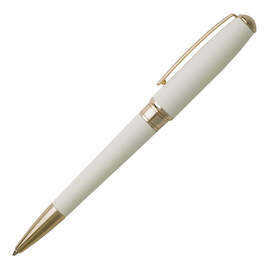 Luxurious yet simplistic. 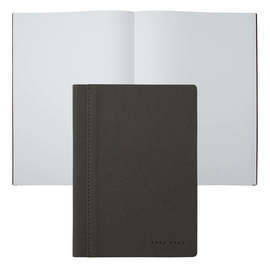 Premium quality leather notebook covers from the Hugo Boss 'Prime' range, providing distinctive covers for A6 and A7 sized notebooks. 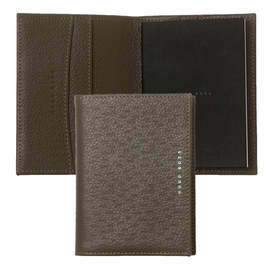 Textured leather cases from the Hugo Boss 'Prime' range. 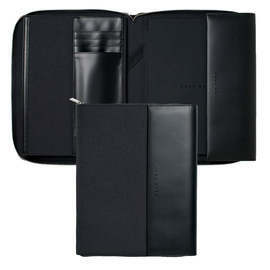 Prime leather goods combined with other premium Hugo Boss items in sets ideal for gifts. 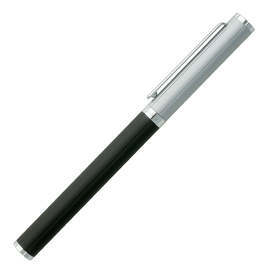 Hugo Boss 'Pure' pens use tapered, modern lines and structural simplicity. Available in a selection of classic finishes with textured barrels. 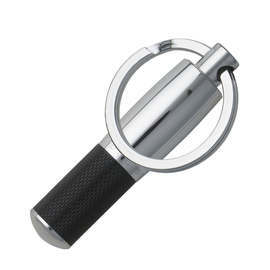 Attractive chrome-plated brass key fobs with finely engraved texturing. 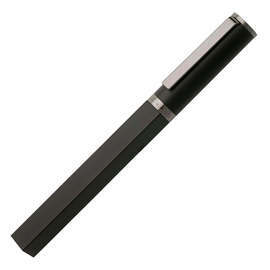 The Pure range also includes USB storage capacity options. Combinations of the Pure range ideal for gifts. 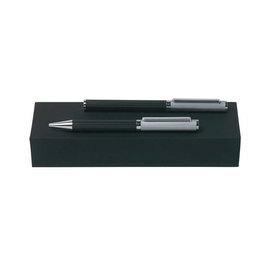 Perfectly matched sets include pens, notebooks and USB keyrings. The 'Reverse' range features matt black barrels contrasting with crisp light chrome caps and accents. The finely engraved surface textures play between geometric pinstripes and diamond patterns providing a tactile texture along the full length of the straight profile. Reverse pairings presented as gift sets. 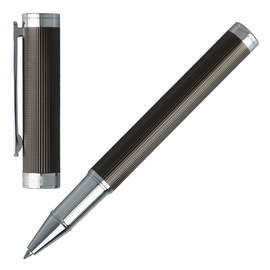 Finely engraved surface textures on contrasting matt black and light chrome bodies. 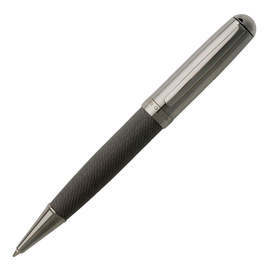 The 'Sophisticated Diamond' ballpoint pen has a chrome cap with an attractive and intricately engraved diamond pattern. 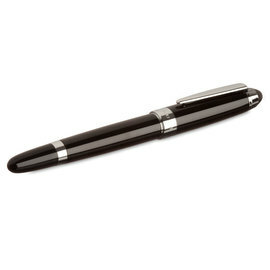 Finely engraved stripes run perpendicular to the chrome-plated torpedo-shaped profiles of the Stripe range to give a balanced and tactile writing experience. Stripe pairings presented as gift sets. 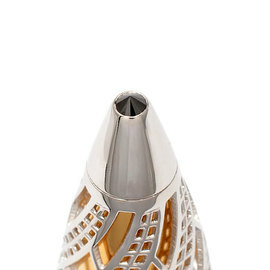 Finely engraved stripes on torpedo-shaped chrome profiles.